Samuel Goldstein, a student at Ashville, a prep boarding school in North Carolina, will remember his 2016 Spring Break visit to the British Virgin Islands-his fourth trip here-joining his family who has been coming to the territory since 1976. 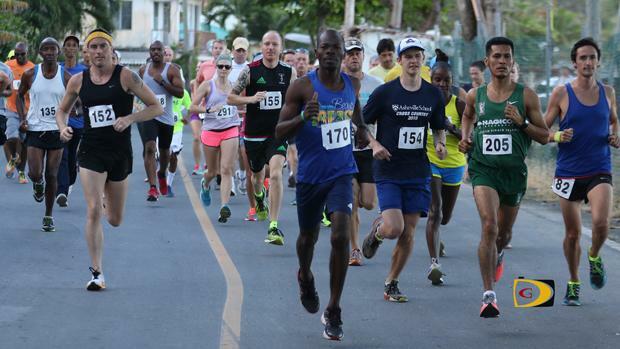 Goldstein laid off the pace, then surged past early leader Reuben Stoby to win Saturday's Blenheim Trust 5K Carrot Bay Classic in a course record time of 16 minutes, 50.1 seconds. For Stoby who was second in 17:23, it was his second successive setback after Vincent Fourniner took the opening race of the series in Road Town. "It was a great race and he took it out hard and was giving me a little fear," Goldstein said. "I passed him after the hill-a bigger hill than I thought I would be-the grade coming back was not as bad as I expected it and I was able to get on top of it really well and I was able to push to the finish." Goldstein thanked his coach John Smith for preparing him over the winter. "This was a great opener," he said. "Now, I have to start preparing for track." Before the race, Stoby said Goldstein told him that he was a sub 17 minute runner over 5K. "I knew I was going to be up against some competition," Stoby said. "It's a pity I wasn't able to go with him to push myself a little bit more, but I wasn't in top top shape. I think I may have taken it out too hard trying to set the pace. I wanted to go hard, see if I could make a break away but he didn't bite that one." Women's winner Rosmond Johnson who's recovering from the flu and ran 22 minutes even, said it was a challenging race. "At one point I thought I wouldn't pull through but I did, thank God," she said. "On the hill coming back, I felt a little shortness of breath so I stopped, caught my breath and then I went again. I pulled through and I won." The race was something Vanessa King always wanted to do, but as a new mommy she decided to use the race to get back in shape. "I always wanted to do it so I decided to take an item off my bucket list," she said. "It was tough for me as a newbie but I enjoyed it. I liked that the course was by the water and you had the sea breeze and it wasn't hot. I also liked that we had the challenge of a hill and it wasn't just flat and I liked the spirit of the runners. They cheered you on." Final Results. Men: 1. Samuel Goldstein, 16 minutes 50.10 seconds. 2. Reuben Stoby, 17:23.5. 3. Julius Farley, 18:44.5. 4. Guy Williamson, 19:07.8. 5. Jeremy Zuber, 19:44.4. 6. Alex Dale, 19:59.5. 7.=Paul Hubbard, Simon Cook, 20:10.5. 9. Antony Spencer, 20:29.5. 10. Martin Trott, 20:49.3. 11. Guyp Dubois, 21:00.9. 12. Adrian Dale, 21:05.5. 13. Emrol Amsterdam, 21:12.7. 14. Reu Rymer, 21:42.5. 15. Chris Berlet, 22:12.8. 16. Dave Pettigrew, 22:23.2. 17. Gabriel Obregon, 23:07.3. 18. Luka Chalwell, 23:37.3. 19. Claudius Rhymer, 24:14.8. 20. Aaron Gardner, 24:22.2. 21. Zebalon Mclean, 25:28.5. 22. Barry O'Lane, 25:30.1. 23. Dennis Versoza, 25:43.7. 24. Richard Morgan, 27:28.7. 25. Howard Moore, 29:35.6. 26. Dennis Delacruz, 29:38.6. 27. Teejay Torres, 29:57.1. 28. Shane Donovan, 29:59.3. 29. Marvin Flax, 30:04.5. 30. Jim Cullimore, 30:30.0. 31. Ravenol Santos, 31:29.5. 32. Barry Leon, 34:55.2. 33. Robert Williamson, 36:15.8. Women: 1. Rosmond Johnson, 22:00.5. 2. Melissa Brunner, 22:29.2. 3. Lauren Julien, 23:14.2. 4. Juliane Potgieter, 23:51.5. 5. Kay Reddy, 23:52.2. 6. Gillian Plaxton, 24:32.1. 7. Philomena Robertson, 25:27.4. 8. Simone Gribble, 25:29.9. 9. Melisande Rowe, 25:49.5. 10. Brodie Faragher, 26:00.5. 11. Jude Holmes, 27:27.5. 12. Cayley Smit, 28:00.0. 13. Zoe Bickerton, 28:26.4. 14.Clair Burke, 30:41.4. 15. Vanessa King, 30:43.9. 16. Nedy Ador Dionicio, 31:11.7. 17. Simpa Ganadillo, 31:38.8. Walkers: 1. Adenike Sicard, 51:52.1. 2. Belinda Dabbs, 56:10.5. Youth 1 Mile: 1. Sammy Potgieter 8.20. 2. Charlie Potgieter, 8.55. 3.= Sebbie and Xavier Morgan, 10.49. 5. James Tucker 14.45.